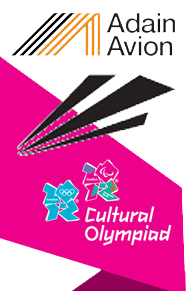 Due to popular demand and on the request of the Adain Avion 2012 Cultural Olympiad, a new SplinterBike has been born. 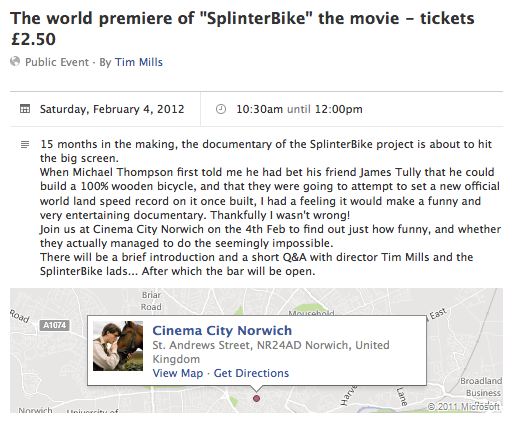 I am delighted to invite you to an exclusive event to witness the revealing of SplinterBikeQuantum. "No bolts or screws, just wood and glues!" With adjustable handlebars and seat, a variety of competent riders can now enjoy the thrill of riding this 100% wooden concept bicycle. There will be an opportunity to ask questions about the SplinterBike Project and also the chance to mount this unique vehicle - as long as you have an inside leg measurement of 32" or more! Kindly hosted by: Quantum Industries Ltd. Please email or call me should you need any more information. ...time to seal the deal! It's taken a while to get all the Lignum Vitae bushings made and set in SplinterBikeQuantum's monocoque and now the time has come to glue the two halves together and permanently encase the bottom bracket and pedal gears. I recycled some old Crown Green Bowling Bowls to create the Lignum Vitae Bushings for all the areas that turn in opposing directions. 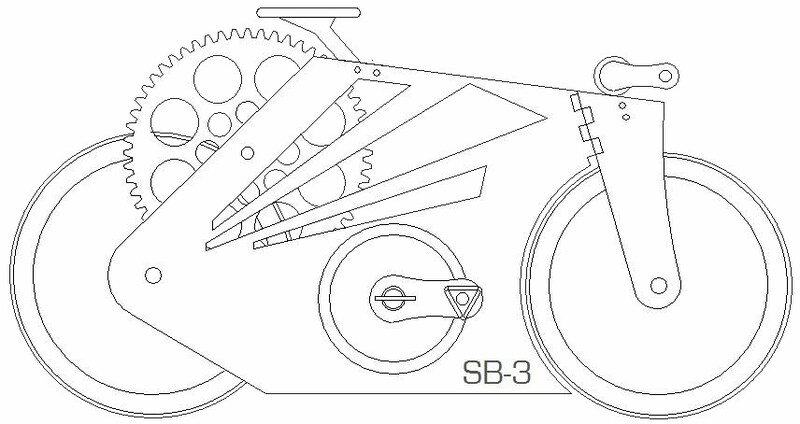 At last, winter is over and despite the current damp spell I'm busy assembling the new and improved SplinterBike in preparation of our next mission... 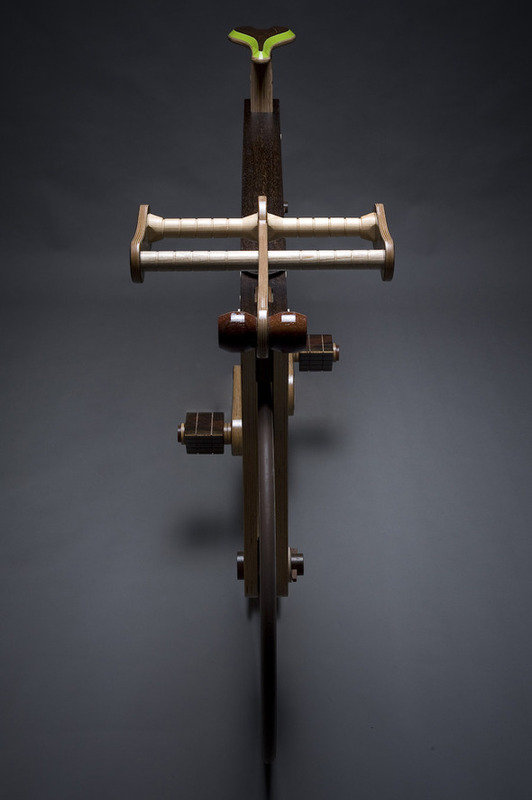 The Hour Record for 100% Wooden Bicycles - this will require No1 SplinterBike rider James Tully to pedal SplinterBikeThree for 60 minutes and the total distance travelled, without putting his feet down, will be the new Hour Record for 100% wooden bicycles. I'm starting from the ground up and as usual, the only materials I can use are: wood and glues, no bolts or screws! In addition, I have been asked by the Cultural Olympiad, which is part of the London 2012 Olympics, to produce a special model that has an adjustable seat and handlebar positions to give more people the chance to have a ride. SplinterBikeQuantum will be included in the Adain Avion event as part of the London 2012 Festival – a chance for everyone to celebrate London 2012 through design, dance, music, theatre, the visual arts, film and digital innovation. Get your name on SplinterBikeThree! So, the DVD has been available for over a week now and people from all over this crazy planet of ours have been busy placing their orders and enjoying the film. One of our BIGGEST fans (he's very tall, and goes by the name of Rogier) has even captured the moment that his copy arrived at his home in Belgium, by making an Unboxing Video! World Première of the SplinterBike film, which captures the surprising highs and inevitable lows of our long and often arduous journey. Produced & Directed by Tim Mills - TopBox Media. I must confess, I was slightly apprehensive about it all. I hadn't seen the documentary in advance and there is something quite unnerving about watching the last year of your life on a 30' wide screen along with 96 people for the very first time! Tim had assured me on several occasions that I had nothing to fear (but fear itself) and that everything was going to be portrayed as it should be. James however, had resigned himself to accept whatever was coming and didn't hold back on the Shandys prior to us taking our seats in Screen No2 of Cinema City. Now that's how a true Triathlete conducts himself! If you would like to order the DVD for your own personal delectation, then simply click here and send Tim a message. He will respond and put you on the list. Enjoy, we all did! This morning, the postman delivered the post as per usual. Little did I know that amongst the usual tittle tattle of broadband offers, double glazing bargains, charity appeals and the odd Crimbo card or two was a little piece of SplinterBike history... FAN MAIL!!! Each year, our biggest fans, Bob and Sally Turner produce a Christmas CD for their friends and family. Last year they we're inspired by the work of Theo Jansen and his amazing Strandbeest project. This year, is our year... Bob and Sally have designed their CD cover using the Splinterbike story to help bring a smile to all who recieve it. The CD is entitled "Another Reason to be Cheerful" and it includes 20 uplifting and thoughtfully selected tracks to inspire the listener. Thanks for sending us a copy!!! Here's your chance to get in the SplinterBikeClub! An exclusive elite of wooden bicycle enthusiasts, hacking away in their sheds and garages to make the world a better and slightly funnier place. The money raised will help us develop our ideas and stretch the possibilities of 100% wooden bicycles to breaking point. We also want to raise funds to tour our ideas and concepts within schools and colleges. We are keen to get you involved with our bike project. Maybe you are struggling to find the perfect gift for that special person this Christmas? Why not give the gift that keeps on giving and buy them a piece of SplinterBike history! Not only will you become a member of the SplinterBikeClub, you will also receive this keyring which has been made from the same wood stock from which the original SplinterBike was created. A blend of Ekki and Birch come together to create the perfect fob for your shed or garage key. I have just returned from my 1800 mile trip to Switzerland and back. I took SplinterBikeTwo to show the delegates at the conference for the SAH - Schweizerische Arbeitsgemeinschaft für Holzforschung which is the Swiss association for wooden research. My new friend Iwan, the chap who booked me to give the SplinterBikeProject lecture, found out about us when he was asked to organise a dinner speaker. He simply typed into Google... Wood, energy and technology and up we popped and off we went! This video shows the last minute of my presentation, if you or your organisation would like me to speak at your event then please get in touch via the Contact Us page or click here.